ICICI Bank led the 31-bank consortium that extended credit to the tune of Rs 5280 crore to Mehul Choksi's Gitanjali Group. 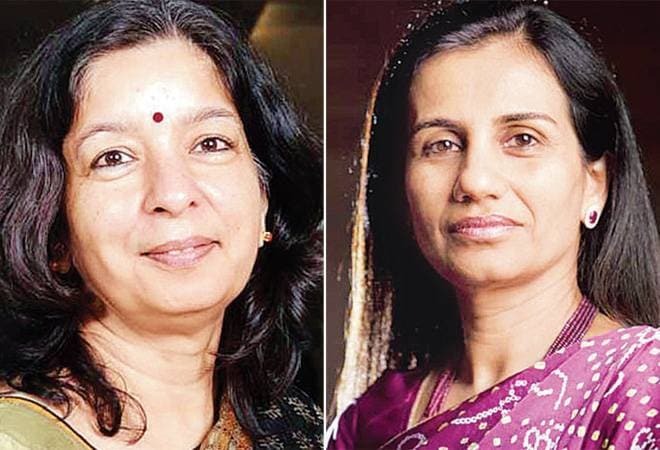 The Serious Fraud Investigation Office (SFIO) of the Ministry of Corporate Affairs on Tuesday summoned the ICICI Bank CEO Chanda Kochhar and Axis Bank MD Shikha Sharma in relation to the probe in Mehul Choksi's Gitanjali Gems fraud. BSE has also sought clarification from both Axis Bank and ICICI Bank on the news report. ICICI Bank led the 31-bank consortium that extended credit to the tune of Rs 5,280 crore to Mehul Choksi's Gitanjali Group. ICICI Bank alone had given Rs 405 crore loan to Gitanjali Gems. According to media reports, top bank executives are only being questioned for clarifications and not as accused in the loan fraud case. Meanwhile, the ICICI Bank has said its exposure to the Gitanjali Group is not the largest among the consortium lenders. The CBI had earlier questioned ICICI Bank Executive Director NS Kanan as part of the investigation in India's biggest banking fraud. The SFIO's Mumbai head has confirmed to India Today that both Kocchar and Sharma have been summoned. "They have been summoned for giving the loan facility to Gitanjali Group. Our intention is to get the information from these two banks. We would like to question both of them." The SFIO also said PNB MD and CEO, Sunil Mehta, has been summoned on Wednesday. A slew of agencies, including the CBI and ministerial arms like the Enforcement Directorate as well as the SFIO are probing the scam. According to PTI, V Srinivasan, Deputy Managing Director of Axis Bank was seen exiting the SFIO office in south Mumbai on Tuesday. The CBI on Tuesday detained Vipul Chitalia, the vice-president of Gitanjali Group of Companies, as a part of its probe into the multi-crore Punjab National Bank (PNB) fraud. Chitalia was apprehended at Mumbai airport and brought to the Central Bureau of Investigation (CBI) office at the Bandra-Kurla Complex here for questioning, he said, but did not divulge any other details about Chitalia's alleged role in the PNB fraud. On Monday, the National Company Law Tribunal (NCLT) issued orders restraining Nirav Modi, Mehul Choksi and 60 entities, including various individuals, companies and limited liability partnership firms, from selling their assets so that the government can recover funds siphoned off by them in the Rs 12,700 crore PNB fraud. One of the biggest financial scams of the country surfaced when the companies of Nirav Modi and Mehul Choksi approached the PNB's Brady Road branch, Mumbai, in January this year, seeking LoU for payments to suppliers. The official handling the case sought 100 per cent cash guarantee before any such letters could be issued to which the company officials said no such guarantee was sought in the past. In a response to the report, ICICI Bank has said the bank has "no exposure to the Nirav Modi group of companies". "We (the bank) have not issued any Letter of Undertaking (LOU) nor do we have any buyer's credit exposure against LOUs with respect to the Nirav Modi group of companies as well as the Gitanjali Group of companies." The bank has also clarified that it was "working capital lenders to the Gitanjali group of companies along with several other banks in the consortium". Saying that the bank was fully cooperating with the investigation agencies, the ICICI Bank said: "Our exposure to the Gitanjali group of companies is not the largest among lenders in the consortium."